Mark Regan has kindly typed out this short report from the HK Telegraph of 17th March 1906. Fire broke out in the cooperage department of the Green Island Cement Works, Hunghom, at about eight o’clock last evening. When the brigades from the Kowloon Dockland Yau-ma-ti Police Station arrived the flames were burning furiously and had a good grip on the building. The fire-boat also arrived and materially assisted in extinguishing the blaze. 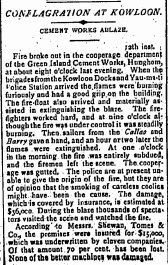 The fire-fighters worked hard, and at nine o’clock, although the fire was under control it was steadily burning. Then, sailors from the Callas and Barry gave a hand, and an hour or two later the flames were extinguished. At one o’clock in the morning the fire was entirely subdued and the firemen left the scene. The cooperage was gutted. The police are at present unable to give the origin of the fire, but are of opinion that the smoking of careless coolies might have been the cause. The damage, which is covered by insurance, is estimated at $36,000. During the blaze thousands of spectators visited the scene and watched the fire. According to Messrs. Shewan, Tomes & Co., the premises were insured for $15,000, which was underwritten by eleven companies. None of the better machines was damaged. HF: Mark is unsure whether the first ship mentioned is the Callas. Can someone confirm this? 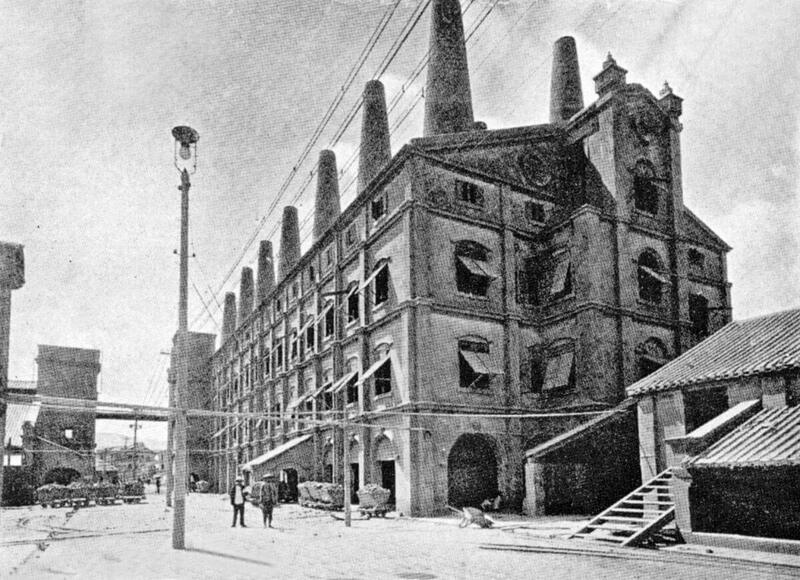 This image of Green Island Cement Company is from c1904 and was sent by IDJ. This article was first posted on 19th May 2015.